If there is one thing you need for your upcoming New Years Eve party it is some champagne gummy bears! 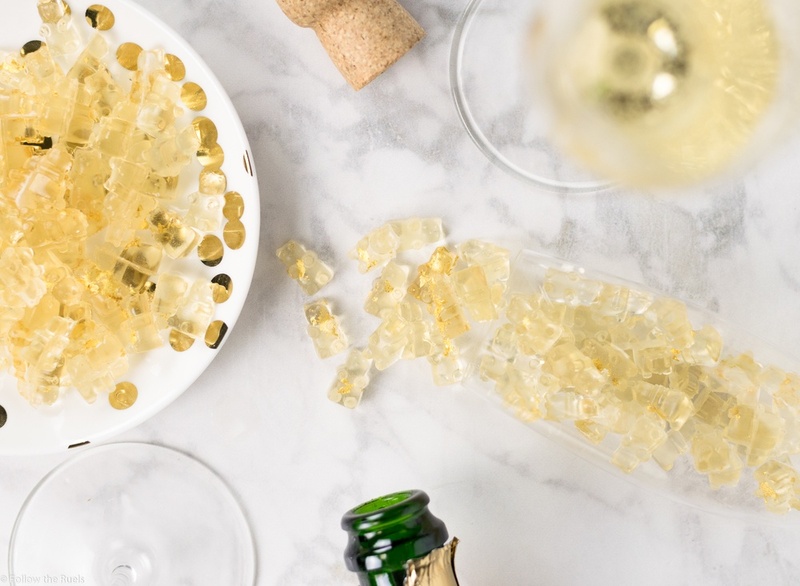 Yes, you can actually make gummy bear candies with champagne! Isn't that awesome? You may have seen rose, champagne, or other wine-flavored gummy candies by Sugarfina in your local gift stores or fine food stores, but they are awfully expensive. A small box of gummy bears will run you about $10. Yikes! Why not instead make your own? They are surprisingly easy to make! To make the gummy bears you will need a few silicone candy molds. You can find gummy bear candy molds for less than $10 on Amazon (I have linked a few below that can be shipped to your house in 2 days). But if you already have a silicone candy mold at home in another shape, that would work just fine. They don't have to be gummy bears. You will also need unflavored gelatin, champagne, sugar, and water. All things you can get at your local grocery store or you already have at home. I also used a bit of edible gold leaf to make these champagne gummy bears extra festive, but that is totally optional. First, mix the gelatin into the water to coagulate. The gelatin will immediately soak up the water and form a big gelatinous ball. Add the gelatin, champagne, and sugar to a saucepan and turn the heat on to low. You do not want to boil this mixture, you just want to slowly dissolve the sugar and melt the gelatin. Continue stirring until the gelatin is completely melted. Like this! Since not all the gelatin may have melted, it's a good idea to run the mixture through a strainer to catch any remaining lumps of gelatin. If you want to add gold leaf to your gummy bears, now is the time to do it. Use a small brush, toothpick, or another small tool to push the gold leaf into the bottom of the silicone mold. Golf leaf likes to stick to things and will stick to your hands and fingers very easily, so try to keep it on whatever tool you decide to use. Now it's time to pour the gelatin into the molds. You probably received a little dropper to carefully drop the liquid into the molds, but we don't have time for that. Just pour a little bit into the center and use a spatula to spread it around to fill all the molds. The gummy bears will start to set up after about 60 minutes at room temperature or 30 minutes in the fridge. Once they are set, they should pop right out of their molds. And now you have your very own homemade champagne gummy bears! Aren't they cute! Not a bad way to kick off the new year! Sprinkle the gelatin over the water and mix in with a spoon. The gelatin will immediately start to set up. Add the gelatin, champagne, and sugar to a sauce pan and place over medium-low heat. Continuously stir the mixture as the sugar dissolves and gelatin melts. Once the gelatin has melted, about 5 to 10 minutes, pour the mixture through a strainer into a container with a spout. If adding golf leaf or other decoration to the candy mold, add it now before the mixture cools too much. Pour the mixture over the mold and even it out with the back of a spatula so that all the cavities are filled. Place the molds in the fridge to set for at least 30 minutes or longer. Turn each cavity inside out to release the gummy bear from the mold. Serve immediately or store in an airtight container until ready to use.